Stoneware bowl with a black and red/brown tenmouku glaze and fluted line decoration. Stoneware body made up of two Devon ball clays, one Dorset ball clay plus fine grog. Makes a very plastic throwable body. The bowl is thrown and then turned and fluted in the leather hard state. Biscuit fired at 950 deg.C and then glazed in tenmouku glaze which is a high iron felspathic glaze. Fired in a reducing atmosphere at 1300 deg.C - 1320 deg.C. Thrown on a Leach kick wheel and turned with a homemade mild steel turning tool. The fluting is done with an old hacksaw blade sharpened to a sharp chisel end, half an inch wide. 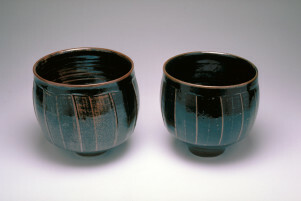 Fluted Tenmouku Glazed Stoneware Bowl, David Leach, 1977 & 1978, Crafts Council Collection: P142a & P142b. This bowl is one of several similar bowls made by myself. Halfway between repetittive making and an individual piece!